This is a favorite with children. It is designed to be as simple as possible and is for younger children. Older children can add other elements to this one, or design different hulls or sails. This craft requires parental assitance and supervision. (Parental Assistance and Supervision Required) Since this is a design for younger children, prefabricate the hulls on a bandsaw, or if unavailable, use a soft wood and cut them with a carpenter saw. Use wood 3/4 inch thick and 21/2 by 7 inches, with the grain running lengthwise. Drill a mast hole to fit the stick, which should be about 6 inches long. Smooth the hull with a sandblock and garnet paper, removing all sharp edges. Crayon for waterproofing. 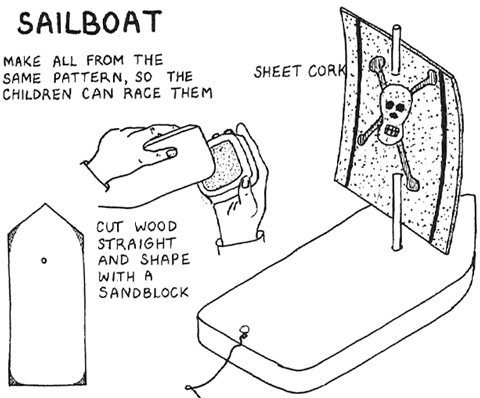 Make the sail out of either sheet cork or heavy wrapping paper, and crayon this, also for waterproofing. Punch holes through the sail for the mast, as shown. Nail a tack on the back of the hull for a string. If the boat is made to these proportions, it will sail quite satisfactorily.